If this blog has a yearly tradition it is my ongoing efforts at photographing Bob Dylan’s Christmas Decorations. Not everyone thinks of Bob Dylan as a Christmassy sort of guy. I know I didn’t. But I do now. It started because I like to inspect the neighborhood Christmas decorations every year and Mr. Dylan has a house in my neighborhood. I grew up worshipping Mr. Dylan. Not too many artists had more impact on my development than he did. And now I believe the same holds true for his Christmas decorating style. Let us examine his approach. There is much to learn. Of all the outdoor decorating styles on display in my neighborhood, year after year Mr. Dylan’s is the most low key. It appears casual to the point of almost seeming unplanned. At first glance it may look thrown together without much forethought. Yet when we examine his efforts in years past,his astonishing consistency reveals the stylings of a very specific Christmas artist at work. First: a brief trip down memory lane. Here is Mr. Dylan’s decor in 2009. Here is Mr. Dylan’s Christmas offering in 2010. This year we see a variation on last year’s theme as he repeats his signature lack of formality. He has again hung the lights in what can now be referred to as a prototypical Dylanesque style.There is resistence to symmetry, the avoidance of an obvious pattern or design. In the detail below we see the return of a classic Dylan touch: the low hanging loop, which some call ‘Dylan’s Necktie’. Others prefer to call it ‘The Crutch’. 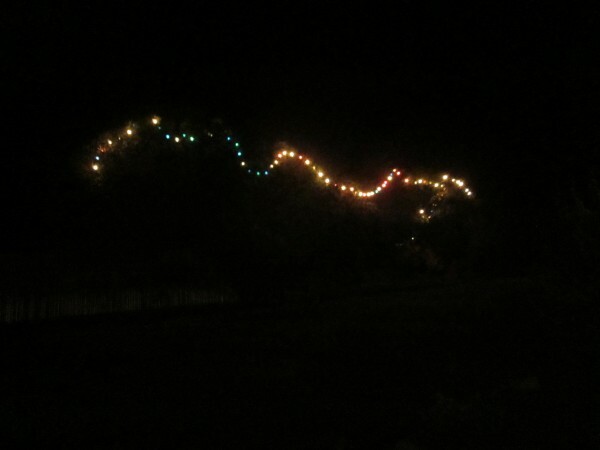 Also this year the lights are higher up on the bushes than in previous years, perhaps indicating a more spiritual intention. Then again, they may be providing a comment about the hopes of the common man in an economic downturn. As with all of Dylan’s best work, ultimately we are left with more questions than answers. Yet tears well up and there is a quiet joy. Or something. Happy Holidays everyone. From me. And from Bob. PS: No matter what the copy on the page reads, my new book is in stock again now. They just restocked them. Buy one, won’t you? This entry was posted	on Tuesday, December 13th, 2011 at 11:41 pm	and is filed under blog post. You can follow any responses to this entry through the RSS 2.0 feed. You can skip to the end and leave a response. Pinging is currently not allowed. Thank you for your Dylan Christmas coverage! In the annals of Dylanania (Dylania?) I have not come across anything about his Christmas lights. Dylan was not associated in the public mind with Christmas until the release of “Christmas in the Heart,” his collection of traditional Christmas songs, in 2009, which is the same year as your first piece about his lights. My first thought upon seeing his lights strung together was a line from “Gotta Serve Somebody” from “Slow Train Coming” (1979): “You might be a socialite with a long string of pearls.” His string of lights is long, although not pearls. But they do sparkle, as a socialite’s string of pearls might. Until 1997’s “Time Out of Mind,” Dylan was never much interested in production, and perhaps that same sentiment has carried over to Christmas lights. You mention that there is an “astonishing consistency” each year, but perhaps Dylan, like the rest of us, simply fails to take his lights down. Thank you again for your piece. You are one of the few people who is able to see something of Dylan’s that is literally blowin’ in the wind. John: I am almost positive that the lights do come down after Xmas. This year they definitely seem higher up on the bushes. Also there is a little “”winter wonderland’ area beyond a gate that my camera refuses to photograph at night. It is made of those chicken wire raindeer and styrofoam candy canes that they sell,among other places, at Costco. Those definitely come down. 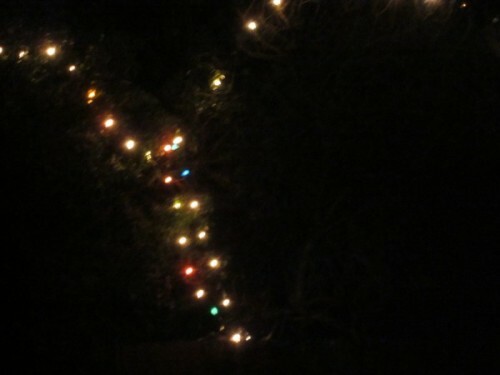 But I am going to watch that string of lights like a hawk and make sure they come down before I post next year. Ordered four. Even with two day shipping it says they will arrive after Christmas, but I’ll take my chances. It won’t be the first time a gift from me is late. After 15 or 20 years of my procrastination, it’s expected and considered a Christmas encore rather than simply a late gift. One is a birthday gift, and the birthday was in November. Today it says they WILL arrive by the 19th! A.J. Weberman would be proud. I feel compelled to point out that I did NOT invade privacy here. This is a portion of a street, most of it decorated. A lot of people will say he stole his ideas from the Christmas decorating styles of classic Delta bluesmen, who were hoodwinked into signing away their rights for a pittance. I say he’s a magpie artist, honoring the old by infusing it with the new. Needs a light up crèche someplace in the upper bushes though. I think it’s a Y for Yuletide. Yes! Now I that know what happened this year with the Dylan Christmas light situation, I can relax and enjoy the holidays. The news in your comment above about the winter wonderland area is enjoyably mind boggling. His decorations are crap since he went electric. Sell out! Any sign of Pete Seeger lurking in the bushes with an axe?